Registration is $39 (fees included) and includes a t-shirt, dog bandana, super drink specials, lots of furry fun! Firm rule: 1 person, 1 dog! The fun begins on Saturday, April 27th at 2 pm! This year we will have the shirts, bandannas and event info ready to pick up from the shelter (1640 S. Armstrong Ave, Fayetteville, AR 72701) starting a week before the event. You are HIGHLY encouraged to pick up your items before the event. We will have limited pick up available the day of the event from 2:00 to 3:00 pm located TBA. 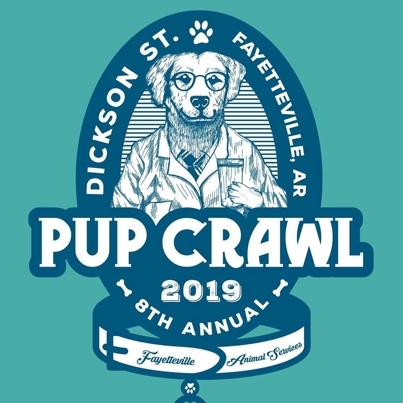 Once you arrive, you can begin your “pup” crawl at any of the participating locations! Stroll around, have fun and meet animal lovers from all walks of life! We will have a passport with all the participating locations and if you get a stamp from each place, you will be entered to win an amazing gift basket full of awesome goodies.